The business aviation industry directed its focus last month to California’s Van Nuys Airport, where the event Business Jets Fuel Green: A Step Towards Sustainability took place. The occasion marked the first time sustainable alternative jet fuel (SAJF) was made available to business aircraft at a public airport. VNY was chosen for the trial debut due to the environmental consciousness of the airport as well the state of California, in general. The groundbreaking event followed on the heels of last year’s launch of the Business Aviation Guide to the Use of Sustainable Alternative Jet Fuel by a coalition consisting of GAMA, NATA, NBAA, EBAA, and IBAC. The document restated the environmental goals of the business aviation industry in 2009, among them: carbon-neutral growth by 2020, and to reduce C02 emissions by 50 percent by 2050, relative to 2005 levels. Among the ways to accomplish that, SAJF was touted as the most effective. “The single largest potential reduction in aviation’s greenhouse gasses is from the broad adoption of sustainable alternative fuels,” Bruce Parry, IBAC’s environment director, told the audience at the event, which was meant to address the “knowledge gap” on the availability of SAJF and to dispel any concerns within the industry regarding its safety. A panel discussion featuring experts from the OEMs, fuel providers, and fuel producers served to educate the audience on the use of the fuel, its benefits to the environment and to users, as well as current and future production. At its most basic, the use of SAJF represents a paradigm shift, according to Steve Csonka, executive director of the Commercial Aviation Alternative Fuels Initiative (CAAFI). Instead of pumping new hydrocarbons from the ground as petroleum, SAJF simply recycles the carbon that is already in the atmosphere and is extracted from plants, which use photosynthesis to utilize it as carbon dioxide. While there has been much discussion about SAJF over the past decade, there has been seemingly little increase in volume. That is attributed to the global economic meltdown, which struck in 2008, a crucial juncture for the nascent biofuel industry. Companies became starved for development capital, thus handicapping the commercialization of large scale production. With that funding becoming more available, fuel producers are looking to expand their production capabilities. Texas-based Gevo, which currently produces SAJF on a per-batch, on-request basis, expects to increase its output from 100,000 gallons of alternative fuel to 12-to-15 million gallons in the 2022 timeframe. Likewise, World Energy, the only commercial producer of SAJF in North America, has a renewable fuel capacity of 40 million gallons a year (currently 15 percent of which consists of SAJF) and is also planning to boost its production to 350 million gallons over the next two years. Of that current amount, most is purchased by the airlines. Indeed, anyone flying commercially out of Los Angeles International Airport is burning some component of SAJF, courtesy of United Airlines. Due to an offtake agreement, the airline has poured approximately three million gallons of SAJF a year into the airport’s general fuel supply for the past several years. Bombardier has had interest in renewable fuels since 2006 when it joined CAAFI through its commercial aircraft division. Gulfstream, which has used the fuel since 2011, signed its own offtake agreement with World Fuel Services in 2015 for SAJF to support its daily flight activities in Savannah. World Fuel provided 8,000 gallons of the blended renewable fuel produced by California-based World Energy for the Van Nuys event. 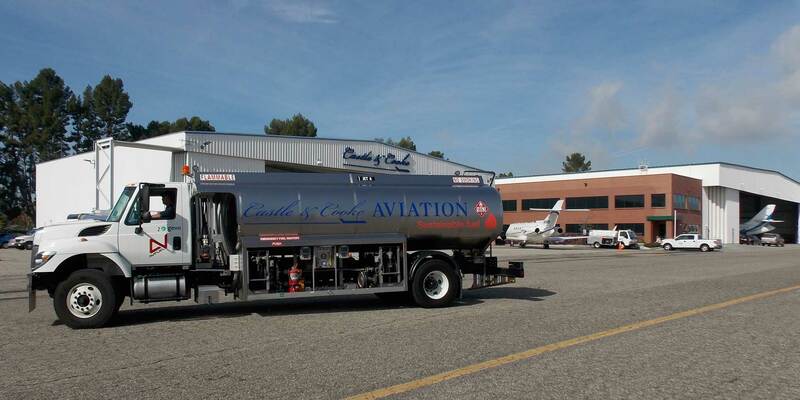 Meanwhile Gevo, through its distributor Avfuel, offered another 6,200 gallons, which was delivered to the four FBOs on the field and in most cases mixed into their fuel supplies. According to Van Nuys Airport Association head Curt Castagna, between the time the fuel was delivered at 6 p.m. on Wednesday and Thursday afternoon, the airport saw more than 140 departures of turbine-powered aircraft. Also drawing from those supplies were aircraft supplied by Gulfstream, Bombardier, and Embraer, which took event attendees on hour-long flights to demonstrate that the fuel is a seamless replacement. Gulfstream set a city-pair record, flying its SAJF-fueled G280 from Savannah to Van Nuys for the event. “This is drop-in fuel. It is jet-A. It just comes from a different source. You can mix it in the fuel tanks,” explained Charles Etter, head of environmental and regulatory affairs and technical fellow with Gulfstream. “It has better freeze-point qualities to it, it has more energy density to it. It’s actually a better fuel.” In addition to those benefits, SAJF contains less sulfur and other impurities than standard jet-A. The Van Nuys event, sponsored by the same coalition that launched the SAJF use guide last year, attracted a list of industry luminaries, including Ed Bolen, NBAA president and CEO; Pete Bunce, GAMA president and CEO; Gary Dempsey, NATA president; Athar Husain Khan, secretary general of EBAA; Bruce Parry, environment director for IBAC; Bombardier Business Aircraft's David Coleal; and Michael Amalfitano, Embraer Executive Aircraft president. Also attending the event were experts from the biofuel production and distribution sectors.